Originally released June 14th, 1992. A version of this review was originally published on April 1st, 2007. The fractious interpersonal chemistry of Manchester’s Chameleons probably cost them the kind of exposure which propelled sometime contemporaries like U2 into the Band-Aid firmament; critically lauded, they found themselves almost permanently at odds with a cabal of tiny labels as well as each other, their opus/classic “Script of the Bridge” meandering into unprompted nothingness. For some, they remain the most important band on earth (A trio of reformation gigs at the dingy Wychwood club in Ashton-Under-Lyne in 2000 saw attendees from four continents) whilst for potential new initiates “Live in Toronto” is one of the easiest points of access. 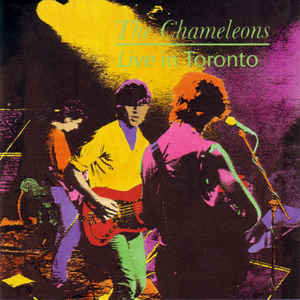 For most bands live albums are an ugly hostage to contractual fulfilment; because however of the parlous state of The Chameleons jigsaw like career – in which a long term home for their music evaded them – “…In Toronto” is far from this, it’s understated rawness adding depth, emotion and intensity to a venerated back catalogue, turning what the marketing men would have labelled a “Greatest Songs” collection. Ugly and beautiful at the same time, it’s a touchstone made by people unable to ever reconcile themselves with an industry that made cheekbones and hype a priority over ability and talent. Many struggled to pigeonhole the band’s complex and intense sound, a conflation of Burgess’ tortured poetry accompanied by The Fall meeting early Simple Minds. Introverted and wary of the machine, unsurprisingly they were neither slick, smart or charismatic enough to escape the world of twilight radio programming in the years between the death of new romanticism and the coming of the C-86 generation. Fate not being without a sense of irony though, by the time singer Mark Burgess and co. played their final north American tour in mid-1987 the effete cod-gaelic rockers they had slogged the pub circuit with were selling out stadiums with their gestural pomposity, whilst they were making do with Toronto’s RPM club. “..In Toronto” opens with Burgess’ pounding bass on the pivotal “Swamp Thing”, before the stark warning of “A Person Isn’t Safe Anywhere These Days” (Introduced with typically understated pathos; “This is a song about getting your head kicked in – it happens a lot where I live”) on which chill melodies interleaved Cure-like as the song’s graphic depiction of violence shook the room. Having nothing new to promote, the band were free to deliver an undisputed set of standards – the elegiac “Singing Rule Britannia” massive, soaring; the nostalgic early rawness of “In Shreds” bursting from it’s post-punk seams. The real joy however is the minimalist post production, a refreshing break from the fraud of posthumously airbrushing performances with edit, studio trickery and over dubbing. Burgess’ stolid intros and outros are strange and funny – spoken in what must have been to the audience an incomprehensibly thick northern English accent – and his voice is raw and emotional, with cohorts Fielding, Lever and Smithies almost faultlessly in syncopation. The final quarter is spellbinding; a plaintive, multi time shifting “Soul in Isolation”, the undulating “Second Skin”, followed by an almost never-ending ten minutes of the claustrophobic “Caution” then finally a maniacal encore blast of “Splitting in Two” which scorches the walls, Burgess screaming the words into corpuscle shredding paroxysm. You ache to have been there. Afterwards the band strolled anonymously into the warm Canadian night, just ordinary people, making remarkable music.